Sugar gets a lot of hate. Commentary can range from “trying to cut back” to comparing it to Crystal Meth and calling in an addiction. It’s publicized as a pretty black and white issue (don’t eat it) with very little grey area. If you do eat it, you’re led to believe you’re making a bad choice and negatively impacting your health. Some would even say you run the risk of developing an addiction, but what the addiction model doesn’t account for is restrictive or restrained eating. If you never let yourself eat sugar, or make yourself feel guilty when you do, it’s easy to start feeling preoccupied or obsessed with it. You may start to feel out of control with your ability to self-moderate, which says more about your lack of practice with moderation than a lack of willpower, self-control or development of addiction. So I’m not going to argue that eating sugar is necessary from a physical standpoint. What I am going to argue is that learning how to live in the grey with food is probably the most productive thing you could do to improve your relationship with food AND overall nutrition quality. Yes, it’s true. Instead of the all-or-nothing thinking that creates extremes in food intake (restriction breeds rebellion), you instead consume food in balance, variety and moderation which is the key to adequate nutrition. While you might think one could achieve that without eating sugar, that has not been my experience. When you have multiple food rules, you actually run the risk of inadequate nutrient intake, and a lot of emotional distress over following the rules perfectly. If you’re a long-time reader of the blog, you know by now that I’ve had a pretty painful, fearful and damaging relationship with food. If you yourself have struggled to overcome disordered eating, you know how absolutely terrifying it is to go against all the food rules you have collected. I cannot emphasize enough how important it has been for me to make peace with ALL foods (have full permission to eat ANYTHING) as a way to put me back in charge of my food choices. I make the choice, not the food. I can absolutely say I feel better when I eat sugar, or at least have the permission to do so. I can eat it when I want it, not eat it when I don’t want it, and stop eating when I have had enough because I know I can have it again when I want it. Giving yourself unconditional permission to eat naturally brings unconditional permission to stop eating. I don’t worry about foods that contain sugar, about adding sweeteners to foods, and I include a much greater variety of foods as I focus on overall food patterns rather than one food or meal. The very act of giving myself unconditional permission to eat has helped me respond to intuitive signals more effectively. This means that all my body processes function better, given I am eating for the intent to feel full, satisfied and energized – mentally and physically. With that as your goal, you’ll find your balance. I think you’ll find that feeling sick after eating has more to do with ignoring intuitive signals (and what you body is truly hungry for) rather than the food itself. While we may assume the opposite, rules about how, when and what to eat can keep us from eating to feel our best. So here’s to sugar. You aren’t addicted, you can be trusted, you do not lack willpower and it isn’t about self-control. I think you’ll find as you open your mind to the bigger picture of health and wellness with less judgment about food, sugar will become a non-issue. Aim to live in the grey! Fantastic read and I can 100% relate! Once I gave myself permission to eat what my my body was craving, I gained control rather than food controlling me….so empowering. Thank you – and so glad to hear that! It’s pretty amazing how that happens; giving up control actually means gaining more control. The great paradox! Thanks for reading and sharing! I’m so glad you enjoyed it, Paula! Thank you for sharing your thoughts and for your kind words! Thank you for your blog (s). I love reading it/them. I think I will always struggle one way or the other but it’s become a lot easier with your constant support. I can’t wait to return to Utah one day and see you. I miss you and your wisdom – a lot ! Miss you Sabine! Thanks for your sharing your thoughts – I hope to see you soon too! I am so glad you find the blog helpful, Patrice! Thank you for your kind words. Have you read Intuitive Eating? I would highly recommend it if not! Cravings for food could be for a lot of reasons – restriction, conditions around eating (in general, not just about certain foods), under eating, hormone imbalances, etc. It’s definitely something to be curious about but hard to diagnose without knowing more about you. I think a great place to start would be with Intuitive Eating. Avoid blaming the food, but instead be curious about beliefs and behaviors around food. Hi Emily – I’ve recently discovered your blog and so appreciate it. I am a therapist, struggling in ED recovery myself, so very much appreciate your honesty about trying to help others while figuring out how to help yourself. I am at the starting point of giving myself permission to eat off-limits foods (practically everything, but especially sugar) and seem to be able to do it in tiny bits but still feel far away from full permission. I was wondering how you actually got from the idea to actually living it. How did you even know what you actually wanted and when to eat it or pass on it? Thanks for sharing your experience! Hi Stephanie, I appreciate your comment and question! This is a tough one for sure. Have you read Intuitive Eating? It’s very normal and natural to feel apprehensive of giving yourself full permission at first, and it’s also natural to not feel like you ever want to say "no" to it at first, especially if there has been a long period of restriction or deprivation. But by consistently reminding yourself that you can have it anytime you want it, you’ll eventually get to a place where you can take it or leave it (because you know it will always be there). Something else I would recommend is to make a list of what recovery looks like to you. Visualize how you would like to think and behave around food. That will provide meaningful goals to practice daily. It was really helpful for me to recognize that I want to be able to trust myself and self-regulate without rules, and have permission to eat sugar so I could participate in social gatherings (especially with my kids). By getting clear on what I valued, living true to those values became easier. I hope that helps! Thank you so much Emily — it does help! Especially the part about participating with your kids. I will use this visualization to help me grab a fork and share my daughter’s birthday cake this week! I know this article is old but I just came across it while reading though your blog posts. I get where you are coming from, but I have to respectfully disagree that eating sugar is good for everyone. 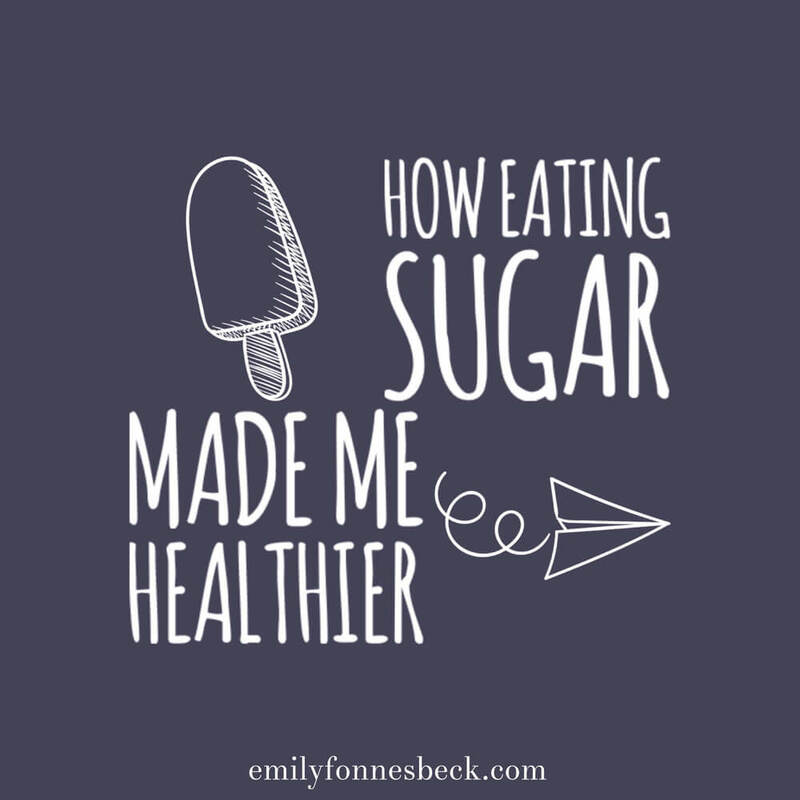 I, as well as many others, have broken sugar addiction (and I was addicted for almost as long as I can remember: I used to live for desserts!). This means it is possible to be addicted to it. I also felt much better when I cut out sugar last year and have been almost a year and a half with no sugar binges. I had a small piece of homemade pie a couple months ago and had no desire to have more that night or the next day. It was such a victory and so exciting to see that sugar addiction can be overcome! I think it helps that I don’t say I "can’t" have sugar. I choose not to eat sugary desserts because it makes me feel ill from the blood sugar spike and crash, but I don’t worry about reading labels in savory things like ranch dressing too much and have no difficulty eating out. I also will probably eat sugar on occasion, maybe once or twice a year. I think going sugar free it can be a choice made for health’s sake, and as long as it is not obsessive or triggering disordered eating, it is probably an optimal choice for many people. Addiction is a complex issue and the research as of yet is pretty inconclusive. I think it’s noteworthy that the addiction model doesn’t account for restrictive or restrained eating so we may be misdiagnosing a restrictive disordered eating pattern as an addiction. The problem with that is that the person is left feeling powerless, when in reality it may just be compulsive overeating as a natural adaptation to restrained or restrictive eating. I’m not saying that diagnosis would fit everyone either; but I think we have to be careful about how we discuss it and make sure not to blanket statement either way. Overall, I would want to validate however someone felt about their food behaviors and work on individual solutions. I was sharing mine! Thank you for your reply. I think sometimes I get so caught up in my own story that I forget that everyone is different.